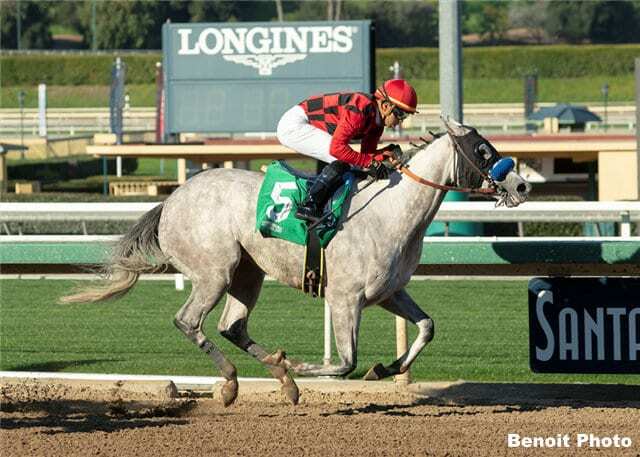 Sent from the gate and in command for most of the one mile journey, Bob Baffert's diminutive Just a Smidge outran her 25-1 to odds as she posted an extra game 1 ¼ length win in Thursday's $59,000 Santa Anita allowance feature. Ridden by apprentice Asa Espinoza, the 4-year-old grey filly by Into Mischief got distance over a “good” main track in 1:37.53. Three-wide into the first turn, Just a Smidge took the lead from Secret Spice and Mo See Cal turning up the backside. With Mo See Cal applying serious pressure to her outside around the far turn, she opened up a two length advantage turning for home and held off the late chare of Starr of Quality for the win. Most recently fifth under the same conditions here on Jan. 11, Just a Smidge, who is out of the Tapit mare Pooh Corner, paid $52.00, $20.00 and $6.20. Owned by Debbie Lanni and a $425,000 2-year-old in training sale purchase, Just a Smidge picked up $35,400 for the win, increasing her earnings to $121,195. She now has three wins from 10 starts. Trained by Bill Spawr, Starr of Quality made a good run into what developed into a modest pace and overhauled Secret Spice for the place by a half length. Off at 11-1 in a field of seven older fillies and mares, Starr of Quality paid $10.00 and $4.00. Ridden by Flavien Prat, Secret Spice took a deluge of late money and was off as the even money favorite. Third by 4 ½ lengths over Fool's Paradise, Secret Spice paid $2.60 to show. Fractions on the race were 23.48, 46.97, 1:11.15 and 1:24.05. This entry was posted in Racing and tagged Bob Baffert, jimmy barnes, Just A Smidge, santa anita by Press Release. Bookmark the permalink.